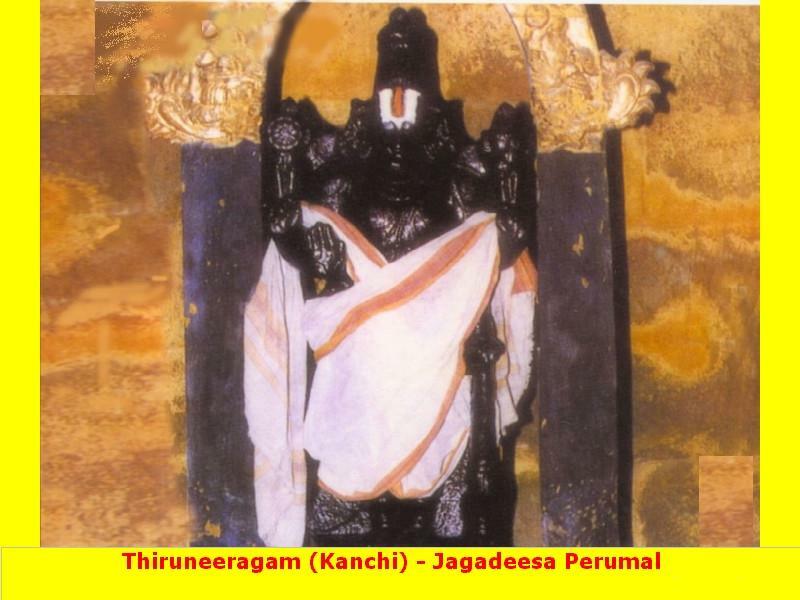 Thiru Neeragam Sri Jagadeeshwara Perumal Temple dedicated to Lord Vishnu located inside the temple premise of Sri Ulagalanda Perumal Kovil, Kanchipuram. Sri Ulagalanda Perumal Kovil has the significance that this temple enshrines three Divya Desams – Thiruneeragam, Thirukkaragam, and Thirukaravanam in its precinct. Neer, the water is the primary and necessary element for all the things in this world to survive. To explain this, the Perumal is giving his seva as "Jagadeswar Perumal". The Perumal is also called as "Thiru Neeragathan" found along with "Nilamangai valli Thaayar". All the water rushes towards the place where there is a small groove or hole. Like the same way, Emperumaan flows into the hearts of bhaktas and and fill their soul with bhakthi. Neer, the water is said to be cool in nature. Like wise, Emperumaan gives the coolest blessings to his devotees. All living things need water to live and at the same time, the body is also purified by water. By explaining this, he tells both the Aathma and the human body to get purified and attain the Moksha, we need his help and the support. Even if a small hole is found in the boat, the water will flow in. Like wise, if even the small level of bhakti is found in the hearts of his bhaktas he will flow into us. But at the same time, if we doesnt think and pray to him, he will go out as the water which comes out of the small hole found in the vessel. The water flows towards all of the regions. It doesnt consider any raised lands or the lowered regions to flow. Likewise, infront of Sriman Narayanan, all are one and there is no higher than the other. The temple is in the prestigious list of the 108 Divyadesas of Perumal. Lord blesses the devotees in a standing form with his right leg pressed on the ground with the left upward. 3 kms from Kanchipuram Bus Stand.